Excepting Image 02, this set was made within a couple of hours on a September afternoon in 2010. Architecture was the subject for the day, but the damp and overcast skies drained colour and cast white as grey. 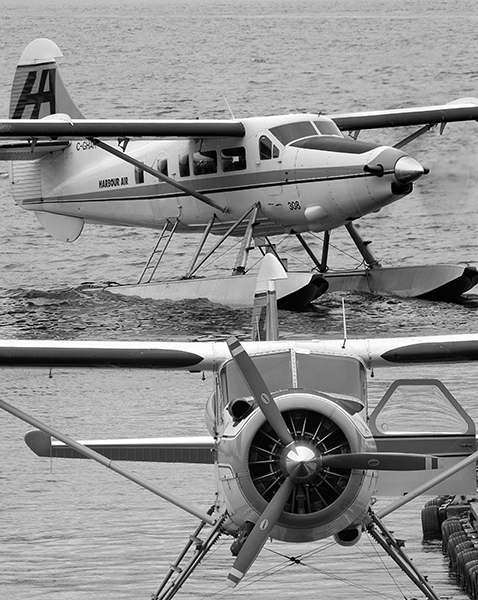 Here, black and white seems entirely appropriate to the conditions as a Beaver floatplane drifted from the dock seconds before engine start. Details of this De Havilland Canada aircraft design built from 1947 to 1967 are noted in the adjacent SEATTLE FLOATPLANES gallery. The weather was very different when this single image was made in 2004. In 2010 I sought to make closely framed records of activity centred on the arrival and departure of 'planes and passengers. 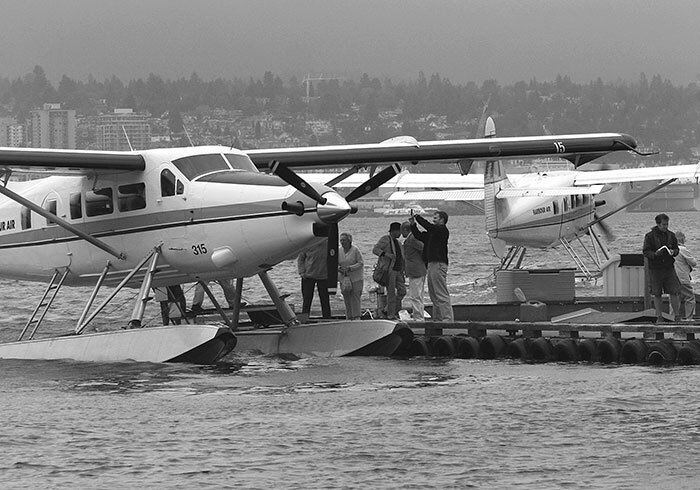 Vancouver Harbour Water Airport was assembled on the open waterfront as a temporary facility in 2004, with the control room perched atop a nearby tower block. 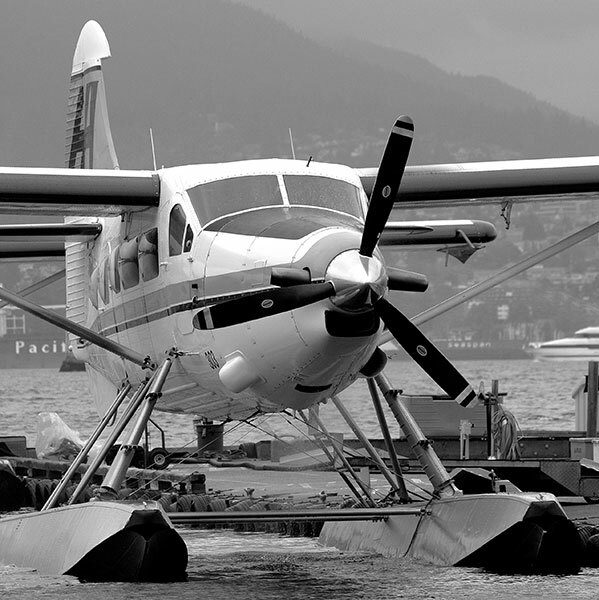 Its predecessor was displaced by construction of the neighbouring Convention Centre where a new seaplane dock facility is approaching completion. Here, an Otter has pushed away from the pontoon tip, turning slowly to port to align with a taxi path to open water. Details of this 1952 De Havilland Canada aircraft design are noted in the adjacent SEATTLE FLOATPLANES gallery. 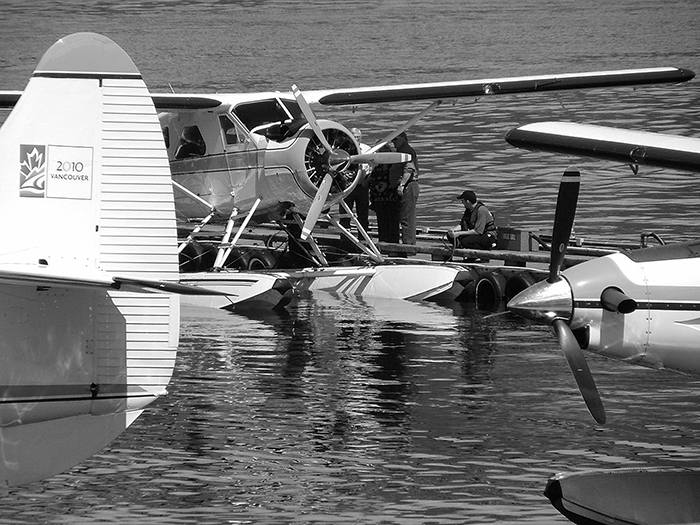 With the pilot’s door ajar, the 'plane is almost stopped at the end of the long pontoon dock where one of the deck crew assists. 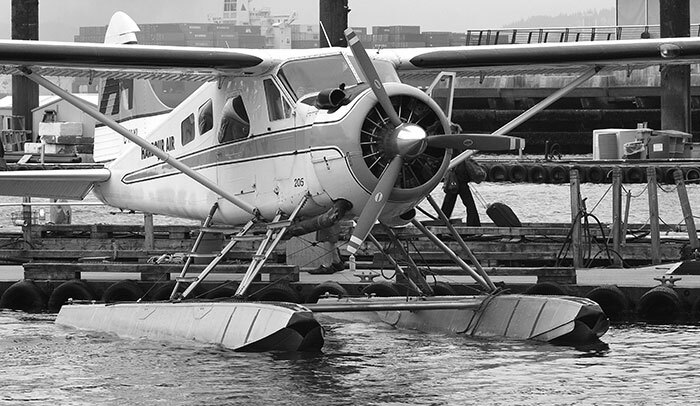 Originally powered by a piston engine, this Turbo Otter and many others have been fitted with a propeller turbine (turboprop) to much improve aircraft performance, payload and economy. Similar updates have been applied to Beaver aircraft. This operation was completed smoothly and within seconds. In poorer conditions or at landing points in remote areas it could be a more exacting task where facilities and assistance might be minimal. The engine is stilled and passengers disembark, one of them recording the event in close-up. 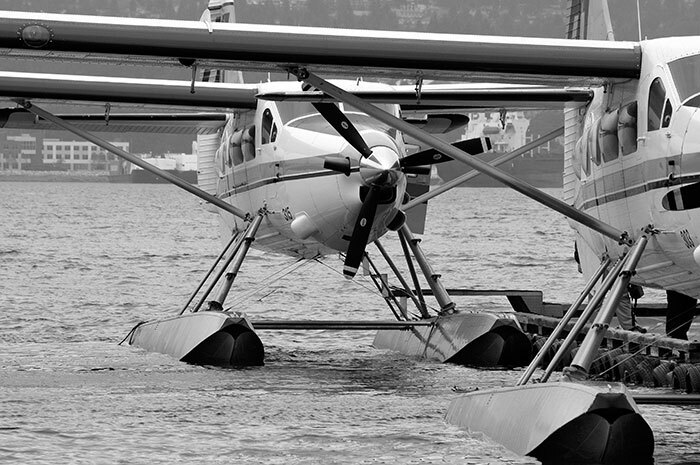 As background, another Otter heads out into the Harbour for take-off. An Otter can carry up to fourteen passengers against the six of a Beaver. The passenger door stands open as the deserted 'plane awaits attention from the dock crew. 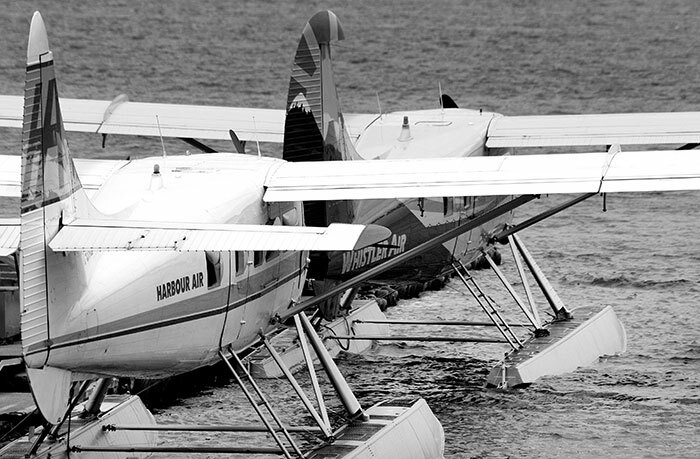 Founded in 1982, the Harbour Air online site headlines its status as being the world’s largest all-floatplane airline with a fleet of some fifty 'planes in conjunction with Westcoast Air. Its routes link Vancouver with Victoria and other Vancouver Island destinations, the Gulf Islands and Whistler inland to the east.. Here, the deck crew is refuelling, cleaning glass and completing pre-flight checks before passengers are boarded. Turnaround times can be short and the crews work quickly. Everything completed, the Otter sits ready for service. Behind, the deck crew completes final checks as the boarding passengers approach behind the companion 'plane. These Otters were moored nearby. 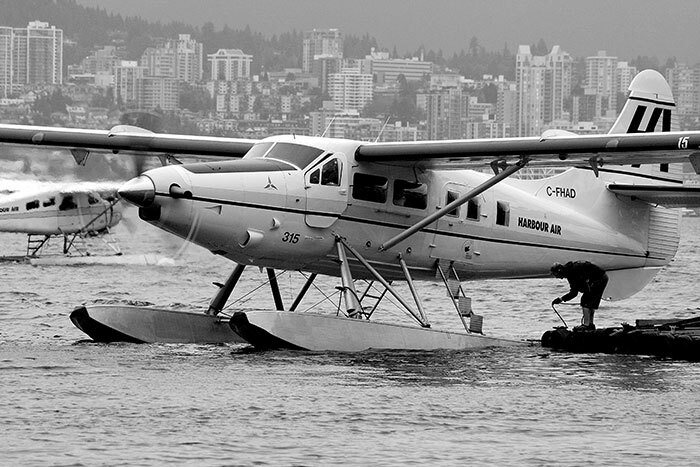 Whistler Air is one of several floatplane operators flying from Vancouver. 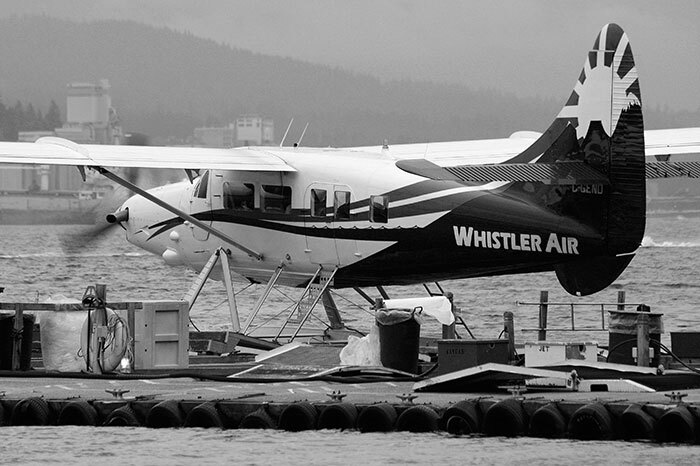 Established in 1985, Whistler Air operates scheduled flights between Vancouver and Whistler using Otter and Beaver floatplanes. 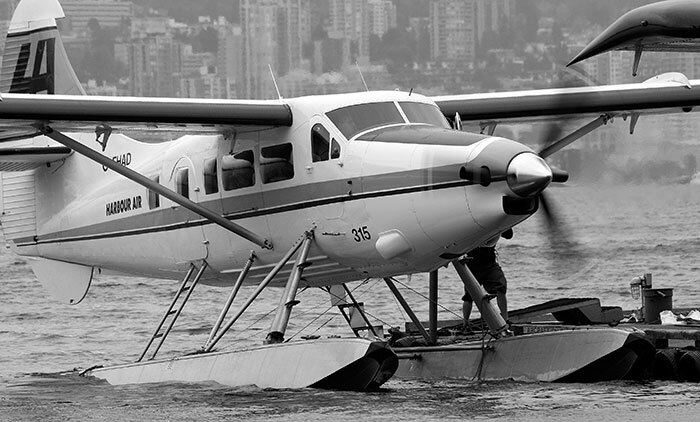 In 2012 it offered charter flights across south-west British Columbia and, in the summer months, a chance to travel by train to Whistler and return to Vancouver by 'plane. Its aircraft sport a striking blue and yellow paint scheme that’s somewhat lost in a black and white image. 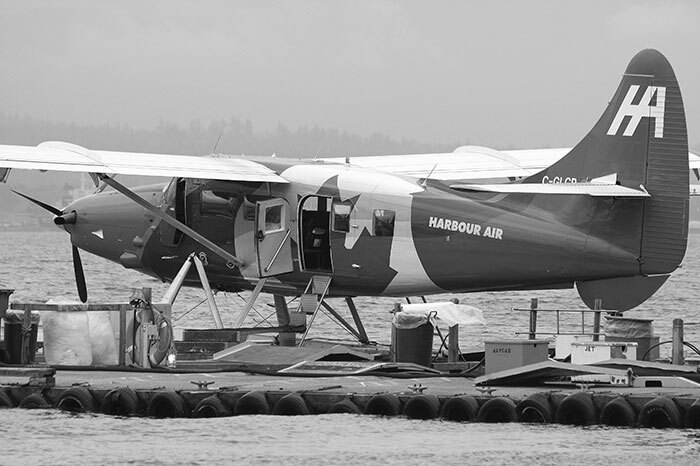 As with the Otter of Whistler Air in Image 12, the blazing red and white maple leaf livery of this Harbour Air machine loses out in black and white. 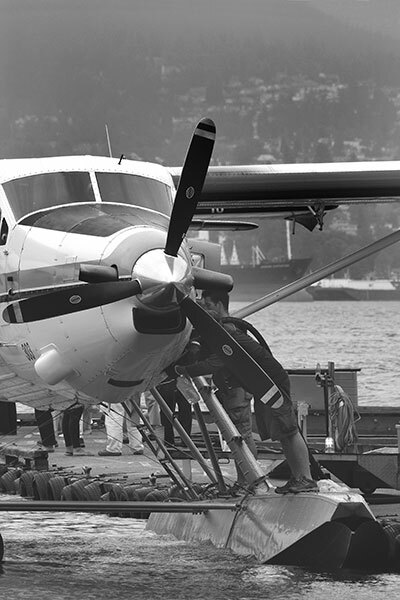 Developed as a turboprop powered addition to the Otter and first flown in 1965, the Twin Otter can carry up to eighteen passengers or a considerable amount of cargo. 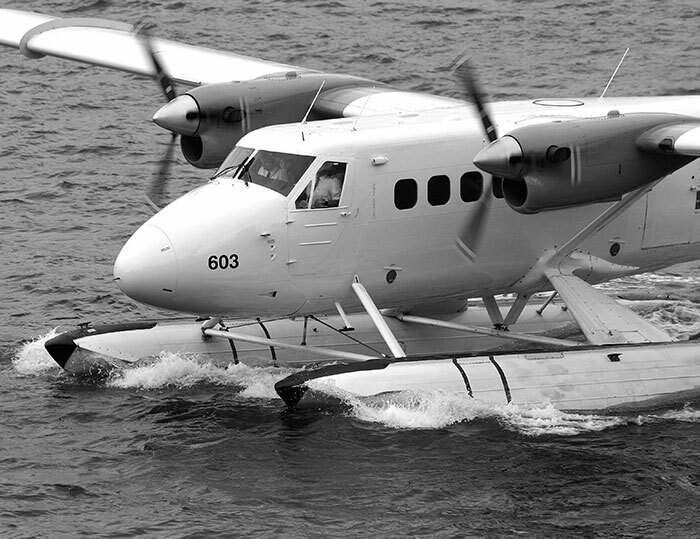 De Havilland Canada was absorbed by Bombardier who, in 2006, sold production rights for the construction of Twin Otters to Viking Air. They recently began production of an updated design to order and also also retrofit Beavers with gas turbine power units. 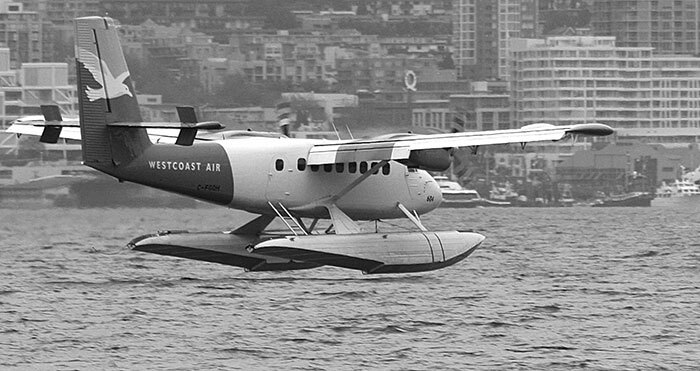 Grown from its origins by amalgamation, Westcoast Air was itself absorbed by Harbour Air in 2010. 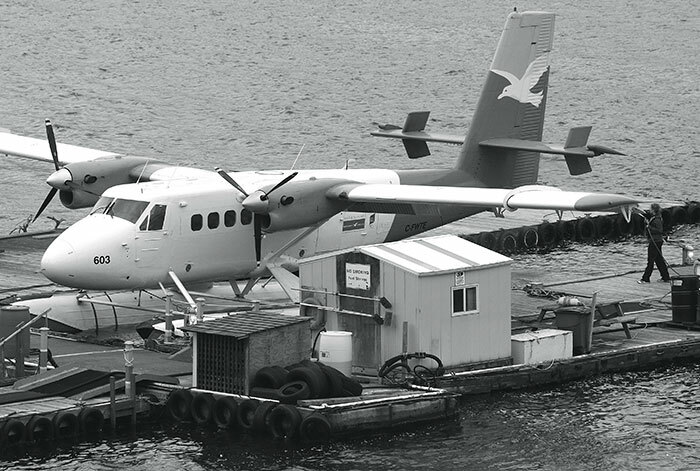 Its fleet contained a number of Twin Otters and these at least retain the name and this livery on their 2012 website. 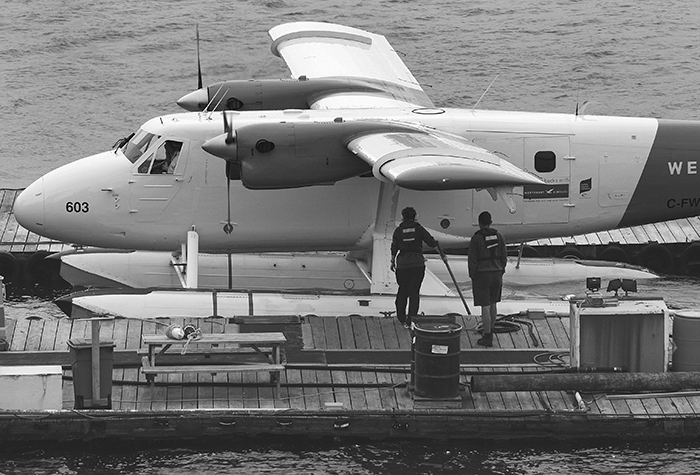 Perhaps not the most elegant of aircraft, the Twin Otter remains an effective performer nearly fifty years after the type’s maiden flight. 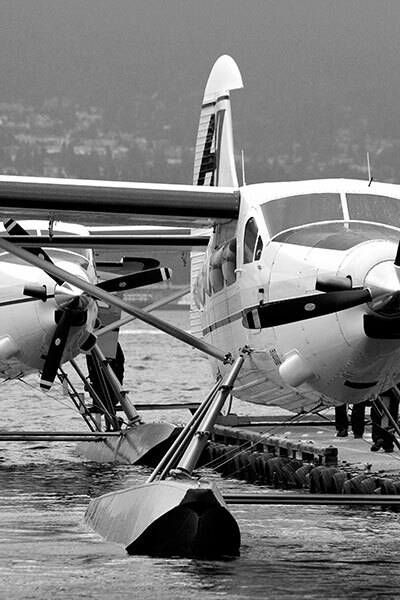 Twin Otters have a specialist twin pontoon dock. Although vantage points for closely framed photography were limited and time was short this was an absorbing and informative session. I regretted the lack of sunshine at the time but with hindsight the grey and rather chilly weather had its own benefits. When this ’temporary’ dock closes, its visual character will not transfer to its intended replacement at which image making may not be so informal.